Today I’m sharing with you a delicious healthy stir fry recipe that you’re going to adore! I love the holiday season: family reunions, delicious food, parties and gifts. Unfortunately the holiday season leaves me with an unwanted gift: extra pounds. I try as much as I can to make healthy food choices during this time of the year but I cannot resist a delicious Brie in the oven with my favourite bread. Once the season wrapped up, I decided to get back to my healthy routine as part of my New Year Resolutions. I decided to cut back on grains for some time and increase my vegetable’s intake. What’s better than a healthy stir fry to help me achieve this goal? The following recipe is so easy to make: less than 15 minutes, healthy and most of all: delicious. My secret ingredient: Blue Dragon Szechuan Pepper Stir Fry Sauce. 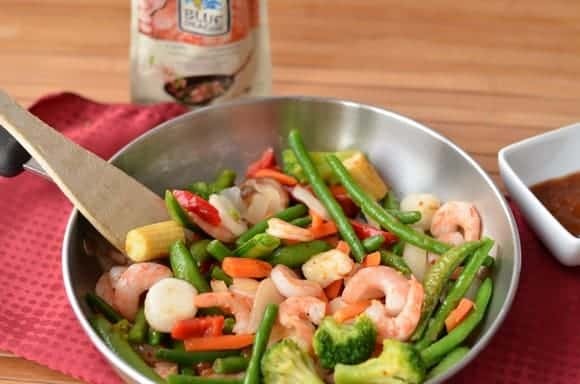 Heat the oil in a wok and add the shrimp, stir fry for 1 minute. Add the vegetables and stir fry for a further minute. Pour over the sauce and simmer for 1 minute. Delicious! Isn’t East Made Easy with Blue Dragon stir fry sauce? The original recipe called for snow peas and red pepper. I did not use fresh vegetables as I cannot find delicious ones this time of the year. Instead, I use frozen vegetables. It saves me quite some time with the prepping and avoids any waste. After all one of the deterrents of eating healthier is the prep time. This will save you time and it is a good start to eat vegetables. This healthy stir fry can be served with rice or noodles but since I am cutting back on cereals, I ate it as is. It is so good and spicy enough to give it that delicious warmth in your pallet. Looking for more delicious ways to enjoy the East Made Easy? Don’t miss Blue Dragon’s new Tumblr! I love browsing all their yummy recipes. 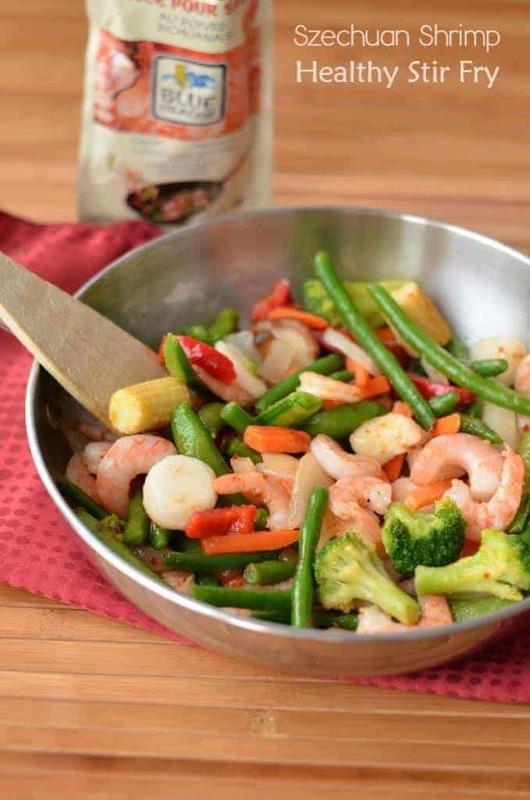 What do you think of this healthy stir fry recipe? What would you change to make it your own? Disclosure: I am part of the Blue Dragon Canada ambassador program and I receive special perks as part of my affiliation with this group. The opinions on this blog are my own. I love a good stir fry and this certainly sounds like it has all my favourite ingredients included. :-), it looks mouth-wateringly good. Mmm, this looks yummy and quick! Right up my alley. I love a good stir-fry made with fresh ingredients! Healthy and yummy! Looks delicious! I love healthy and easy dinners like this that I can get on the table fast! I haven’t made stir fry in forever! I will definitely have to give this a try!!! Thanks for sharing. This really looks great! You asked what I’d change to make it my own … I prefer fresh veggies and I almost always have a fridge full. So I would probably replace the frozen ones with some fresh onions, mushrooms, broccoli and carrots. This looks is a delicious recipe. I made a similar the other night. Trying to stick with my clean eating habit for this year. I lost a total of 2.4lbs so far. Omg!!! This seriously looks beyond delicious!!!! Definitely going to have to give this a try!! I love shrimp dishes! This looks delicious. I’ll have to try it out. That looks so good. We don’t eat a lot of shrimp though, so I might substitute chicken if we make this at home. Frozen veggies do save a lot of time. I use them on nights that we’re swamped with other things to do and I need to get dinner on quick too. I don’t normally like seafood but your pictures are so gorgeous I may just have to start liking it. I love shrimp and eat it all the time. This looks fantastic! Shrimp is my all-time favorite. I could eat it every day of the week, this looks delicious! Everyone in my family loves Szechuan! I’ll have to try that sauce! I hope it’s spicy! I love this recipe! 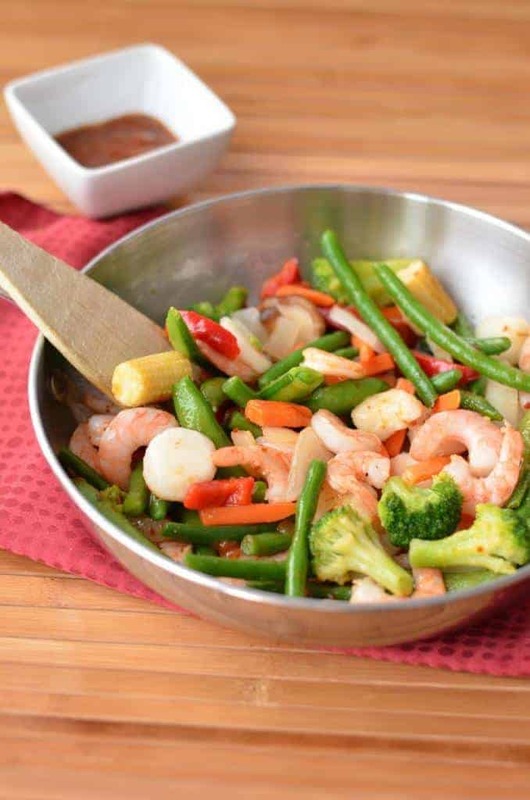 Stir fried shrimp is one of my favorite dishes! It’s so tasty and so good for me. I love shrimp stir fry! It is for sure one of my favorite foods to eat! I love how its healthy too! I’m going to make this recipe sometime soon! That sounds so good. I can’t wait to try this out. I love that it’s a bit healthier, too! Which of These 5 Types of Moms Are You?